We’d love your help. Let us know what’s wrong with this preview of A Deadly Tail by Dixie Lyle. Before you can say, "Lights, camera, murder," Foxtrot and her furry partners-in-crimesolving are caught up in the drama of who-killed-who...and why. With a crazy cast of characters including a neurotic director, a star-hungry diva-even with an appearance by Lassie's ghost-it's bound to have one hell of a twist ending. But first, Foxtrot and her supernatural sidekicks have to find a killer amongst them-before the whole case is a wrap......from author Dixie Lyle. To ask other readers questions about A Deadly Tail, please sign up. This is a good book, for the most part. It was a bit confusing at first in how the dialogue of the animals is conveyed. It's very funny, and any animal lover will get a kick out of that aspect of the story. Reviewed for Affaire de Coeur Magazine: http://affairedecoeur.com. This is one of my all-time favourite series' and book 4 did not let me down - I loved this! This is a cozy series with a "sort of" magical twist, but the major draw of this series is the humour. Dixie Lyle must be an absolute BLAST to be friends with in real life, if the way she writes is any indication. These books always make giggle all the way through at the subtle, and sometimes not subtle humour that is woven in with the plot. The characters in this series are fabulous - absolutely fabulous! This is one of my all-time favourite series' and book 4 did not let me down - I loved this! The characters in this series are fabulous - absolutely fabulous! Mainly Foxtrot, Whiskey and Tango, as the main leads, but even the supporting characters are quirky and clever and super fun! The mystery in this one felt extra complicated for me, but that isn't a complaint, since I never try to figure out whodunnit before the reveal. For me, the characters and the craziness are the thing that keeps me coming back to this series book after book. This was another fine addition to the Whiskey Tango and Foxtrot Mysteries. In this one, a movie crew is filming a new Sherlock Holmes/zombie flick at ZZ's mansion when both the director ends up dead and star ends up in the hospital. One is found on the menagerie property without their head and hands and the other is harmed in an explosion in the mansion estate. Foxtrot quickly jumps into action and starts solving the mystery. All of the usual crew are still present, but they weren't as prevalent This was another fine addition to the Whiskey Tango and Foxtrot Mysteries. In this one, a movie crew is filming a new Sherlock Holmes/zombie flick at ZZ's mansion when both the director ends up dead and star ends up in the hospital. One is found on the menagerie property without their head and hands and the other is harmed in an explosion in the mansion estate. Foxtrot quickly jumps into action and starts solving the mystery. All of the usual crew are still present, but they weren't as prevalent in this edition as in the previous ones which left me missing the interaction with ZZ and Ben. I found the primary mystery to be well done, but in this novel, it was all the secondary happenings that interested me more. Tango is convinced that she can direct an animal film with a feline star and makes a bet with Whiskey to do so. She then starts writing a screenplay and casting the animal spirits who live in the Crossroads Cemetery which is adjacent to the mansion. During the tale, she meets the spirits of Benji and Trigger, as well as some other notable famous characters. Her play is eventually sabotaged and Whiskey actually puts in his investigative hat to determine who is out to get his arch nemesis/best friend Tango (she is a cat after all). I admit it. The reason I like this series is less for the cozy mystery element, and much more to do with the quirky human characters, and the laugh-out loud interactions between the various animal characters, both with each other and with Foxtrot. In other words, they're fun! For example, in this instalment we have a the ectoplasmic dog trying to herd a mountain of ghostly goats, and the sassy cat trying to direct a movie, as well as the inter-star canine rivalry between Lassie (well, Pal, who p I admit it. The reason I like this series is less for the cozy mystery element, and much more to do with the quirky human characters, and the laugh-out loud interactions between the various animal characters, both with each other and with Foxtrot. In other words, they're fun! For example, in this instalment we have a the ectoplasmic dog trying to herd a mountain of ghostly goats, and the sassy cat trying to direct a movie, as well as the inter-star canine rivalry between Lassie (well, Pal, who played her) and Benji, and a cameo by the ghost of Paul the football-results predicting octopus. Compared to the recent run of books I've been reading, this was so light and casual and SO MUCH fun. This isn't the type of book I'd normally buy for myself, but I got it as part of a book swap because "it looks like you like cats" and boy howdy are you right. The pacing is quick and her voice is witty (especially when coming to describing her animal companions and her train of thought). I want this to be my future job. Investigating strange happenings with my cat and ghost dog. A terrific and even fun series for a person who is open to entering w world of animal ghosts, telepathic animals who have some other talents, humans who have other-worldly skills, and many unique personalities plus a murder mystery or few to solve! A Deadly Tail is even better than Trigger, Lassie, and Benji! Telepathic cats, an ectoplasmic ghost dog, a boyfriend who is more than human, an extremely eccentric billionaire boss, an estate full of zombies, a dead body minus hands and head and a bomb detonating inside the mansion makes for another wonderful adventure in this delightful cozy paranormal series. This was actually the first book in the series that I didn’t love. The beginning is kind of a jumbled mess. Foxtrott and Whiskey find a body, then we jump back 24 hours apparently just so that we can meet the crew of the zombie film. During this time jump we meet a Tango lookalike. In the now again they keep acting as if we should know who that cat is. Finally Ben asks and Foxtrott tells him that somewhere between the body and the bombing she actually went to talk to Eli who told her that the ca This was actually the first book in the series that I didn’t love. The beginning is kind of a jumbled mess. Foxtrott and Whiskey find a body, then we jump back 24 hours apparently just so that we can meet the crew of the zombie film. During this time jump we meet a Tango lookalike. In the now again they keep acting as if we should know who that cat is. Finally Ben asks and Foxtrott tells him that somewhere between the body and the bombing she actually went to talk to Eli who told her that the cat in question is the Unsinkable Sam. After this chaotic beginning is finally over we come to the main story of the book, which is split into two storylines. The murder investigation and Tango putting on a movie to prove that cat‘s are the better actors. Though the production actually takes the spotlight. The murder seems more of an afterthought. In the end Foxtrott uncovers the kind of murder that would have made Wile E Coyote proud. I am actually surprised that she didn’t realize the truth by finding a blueprint with the ACME logo in the corner. Suffice it to say that the resolution wasn’t all that grand. The Tango storyline has a lot of fun stuff in it. Kung Fu fighting squirrels! Unfortunately Tango isn’t as witty as usual. Her usual self doesn’t return until the last third of the book, before that she and Whiskey aren’t as evenly matched as usual. Foxtrott also doesn’t shine in this book. She always was a little bit of a control freak, but here she overdoes it a little. While this crime clearly isn’t related to the supernatural, she still thinks she is the only person that can solve is. Suddenly she apparently believes herself to be Hercule Poirot. She pushes her human colleagues away. Even if she can’t explain how she got her information, she can come up with better things than „I can’t tell you“. She faceplants quite badly during one of her Hercule Poirot moments. And it is never a good thing, when the reader actually feels that she deserved that. The good thing is that she realizes it herself and maybe in future books she can grow a little. There are a lot of interesting animals introduced in this book. The Unsinkable Sam, a plethora of animal actors and even the first dog in space. I love those little tidbits. This review has been hidden because it contains spoilers. To view it, click here. I didn’t even get to chapter four before I had to quit. There were already so many problems with the book. When they find the body, Foxtrot isn’t even fazed. Normally the first thing to do would be to call the cops, right? She waits until later to do that. Also, she acts surprised when Whiskey mentions the parting of the Red Sea, which I found ridiculous considering that she doesn’t act surprised when she finds a body. This is a fairly new series for me and I love it. It's very easy to forget that Whiskey is not alive and I'm so jealous that all animals can't communicate like Whiskey & Tango do. Having Lassie and a few other "famous" animals pop in was totally unexpected. I always enjoy seeing how Foxtrot figures the mystery out; what her reasoning is. Looking very forward to the next book in the series. Witty fun fast-paced goofy and entertaining! THE BEST! Dixie Lyle is awesome. This was a fun book. I still love the characters and enjoy watching the world expand. Readers will find the answer in Dixie Lyle’s newest Whiskey, Tango, & Foxtrot mystery, A Deadly Tail. These paranormal mysteries are delightfully whimsical, filled with remarkable animals, eccentric humans, and “Foxtrot”, a woman whose job is to efficiently manage anything and everything that arises. For Foxtrot, the unexpected and the unusual are an everyday occurrence. Apart from her job managing Z’s estate, Foxtrot is responsible for ensuring all is well at When is a murder not a murder? Readers will find the answer in Dixie Lyle’s newest Whiskey, Tango, & Foxtrot mystery, A Deadly Tail. These paranormal mysteries are delightfully whimsical, filled with remarkable animals, eccentric humans, and “Foxtrot”, a woman whose job is to efficiently manage anything and everything that arises. For Foxtrot, the unexpected and the unusual are an everyday occurrence. Apart from her job managing Z’s estate, Foxtrot is responsible for ensuring all is well at the animal crossroads. Her two companions, Whiskey and Tango are a trip. Whiskey is able to transform himself into just about any dog breed that has ever existed, and Tango, her cat, is able to speak the language of every animal alive. Their unique talents come in handy, as does their perceptive commentary. I absolutely adored A Deadly Tail - so much that I read it in pieces just to make it last longer. As I read, I frequently singled out phrases and paragraphs to share with my husband, who loves animals as much as I do. While both Whiskey and Tango are able to communicate telepathically with Foxtrot, they retain the qualities that make them unique as animals. The good-natured cat vs dog competition is fun to watch. I loved the part where Foxtrot is talking Tango down from a catnip trip, and the whole movie making experience with Tango at the head - simply amazing. Dixie Lyle imparts a great deal of humor to her writing, and she frequently uses just the right turn of phrase to turn giggles into bellows of laughter. 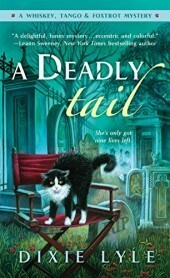 If you love animals, paranormal mysteries with a heavy dose of humor, or both, you will love Dixie Lyle’s newest mystery A Deadly Tail. I received a copy of A Deadly Tail from St Martin’s Press in exchange for an honest review. #4 in the Whiskey, Tango, Foxtrot series. Ghosts, Zombies & Murder, oh my! Dixie Lyle is a wonderfully humorous writer. When reading these books I sometimes get the feeling that the author might have ADHD or some similar condition, but she always manages to pull everything together and wrap it neatly in the end. In this visit to the land of Foxtrot & friends we have a movie in the making, extreme crocet, and a play that is truly the thing. This review is a little hard for me to write. I have loved every book in this series, but this one just didn't do it for me. I loved the writing but was lost in the premise. I think there was just too much going on with this venture. I am sure, however, that I will love the next book and everything will be back on track for me. Loved the latest installment in this series. I loved Tango's play. And the fact that there were more people in this one that could see the ghosts than just Foxtrot and the gang. It would be great if someone could illustrate Keene's masterpiece. And I totally didn't see the twist at the end. Great job Dixie Lyle. Can't wait for the next one. I enjoyed the character relationships and the animals as I usually do in this series. What disappointed me this time was how little of the story was actually about the mysteries. It was delightful meeting animal stars and their imaginary histories as well as the usual nonsense that Keene gets into. However, I would enjoy a lot more story with regards to the mysteries. Good addition that has great character and mystery. I was not too fond of the over use of the animals talking, though I know it was essential to the plot. Perhaps if the author has used conventional quotes instead of the back and forth with italics, and brackets it might not have been as annoying. This book was so much fun to read. You never know where the author is going to go with the 3 main characters but I love the way whiskey and tango interact. Just too silly and over the top for me. Loved it! Bawled my eyes out and can't wait for more. funny! I laughed out loud! I really did! Good read, glad I reread the first 3 books first though or I would have confused myself. Dixie Lyle loves animals, mysteries, books, reading, words, bad puns (are there any other kind?) and once had a torrid summer romance with an entire library. Did I mention the books? Oh, and definitely doesn't believe in the supernatural. Nope, not me. Hey, what was that sound? Where's that spooky green glow coming from? Oh, hello, didn't see you standing there in the corner, what with you being a Dixie Lyle loves animals, mysteries, books, reading, words, bad puns (are there any other kind?) and once had a torrid summer romance with an entire library. Did I mention the books? Oh, and definitely doesn't believe in the supernatural. Nope, not me. Hey, what was that sound? Where's that spooky green glow coming from? Oh, hello, didn't see you standing there in the corner, what with you being all see-through and everything. Want a cup oftea? Moan once for yes, twice for no.